The Oyster Mushroom is one of the finest gourmet mushrooms in the world, but more than just good flavour and a high nutritional profile, this medicinal mushroom contains the active ingredient lovastatin which is proven to reduce harmful types of cholesterol, by 25% in a single calendar month! Pleurotus ostreatus, the Oyster mushroom, is a common edible mushroom. It was first cultivated in Germany as a subsistence measure during World War I, and is now grown commercially around the world as a gourmet food. Pleurotus Ostreatus has a number of properties, but one is exceptional. It's ability to quickly reduce LDL Cholesterol (Low-density, the bad cholesterol) - with reports of up to a 25% reduction in cholesterol levels in a month. It works thanks to it high content of polysaccharides and naturally ocurring statins. The main cholesterol reducing compound is known as Lovastatin, and is routinely prescribed for cholesterol throughout the world. These natural statins block the enzyme in the body responsible for producing the LDL cholesterol, bringing about rapid improvements to LDL cholesterol, and the ratio of LDL to HDL cholesterol (High-density, good cholesterol). 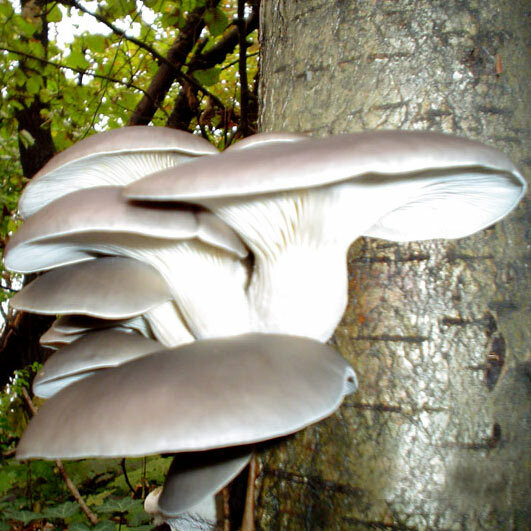 Pleurotus Ostreatus also has a number of general immune system enhancing properties, is anti-inflammatory and helps lower blood sugar levels. It is also antiviral and antibacterial, making it a good regulator of internal flora. There is also some evidence, being further research, that extract of Pleurotus Ostreatus can induce apoptosis (Programmed cell death) in some cancer lines. Active ingredients in the Oyster mushroom include: Polypeptides, polysaccharides, alfa-glucans, pleuran, beta-glucan, lovastatin, natural statins, phelonic compounds and tannins. Each 500mg vegetarian capsule contains 30% standardised polysachharide extract, and all the above listed active ingredients.